Blazing Hot Wok: The Baby's Here! I want to throw out a big CONGRATULATIONS to my coworker. She had her baby on Easter day. 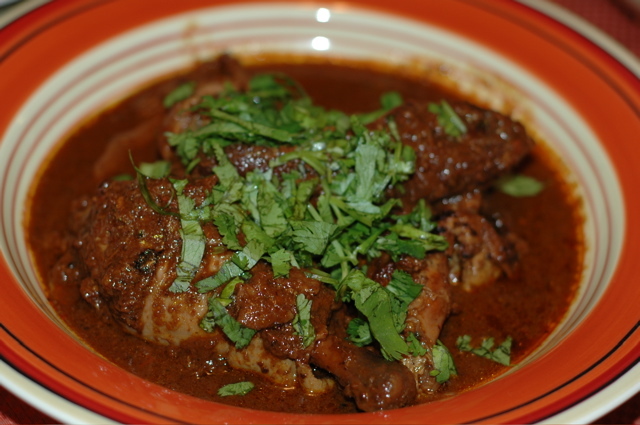 Tomorrow I will visit her and Bundle, and I will be bringing a big serving of comfort food in the form of chicken mole (I just hope it doesn’t make Bundle gassy). There are so many mole variations, it’s overwhelming. My coworker grew up eating a mole made with peanut butter. I’ve seen recipes with cashews while others use almonds. Some recipes call for pumpkin seeds but I use sesame seeds. There are about a million different types of chilies to choose from. I still recommend trying to make the paste yourself at least once. It can be a bit time consuming the first time, but I think it’s worth it. The recipe I use (from Foodnetwork.com; click here for original) gives a double portion, so you can freeze half for future use. Most supermarkets (at least here in the West) have a little section with Mexican spices, including different dried whole chilies. If you can’t find the ones listed, use what you can find. If you don’t want too much heat, substitute the chipotle with another type (and cut back on the peppercorns). I recommend using at least two types of chilies to give the dish a more complex flavor. Some people like to toast their spices before grinding them (I use a food processor). I don’t find it necessary, except for the chilies, for this dish (because I’m too lazy). Since I use roasted cashews, I don’t toast them either. If you use almonds, you should probably toast them (and you may want to shell them, although I don’t think it says to in the original recipe). 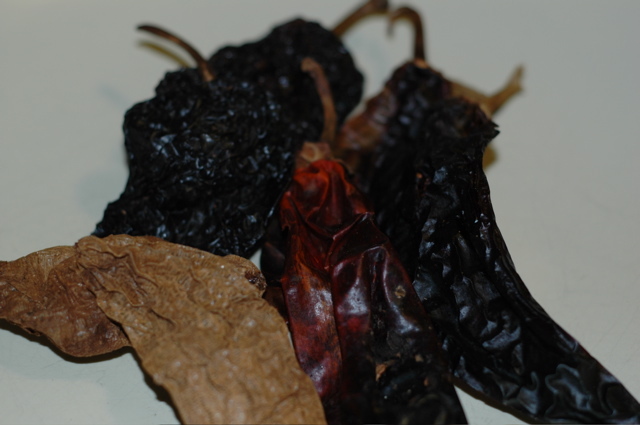 Start by tearing the dry chilies into pieces and toasting them in a dry skillet until they change color. Put them in a bowl with the raisins and cover them with hot water until they soften. Then drain and let cool. Saute the onions and garlic until lightly brown. Then add the tomatoes. Continue to cook for about 10 minutes. Then set aside to cool. In a food processor, first blend the cinnamon stick and peppercorns until the cinnamon stick is uniformly ground (you won’t get a fine powder, but the pieces should be small and about the size of kosher salt; the peppercorns may not grind well and that's okay). Add the nuts, sesame seeds, oregano, and thyme. Blend until you get a uniform mixture. Add the chocolate and blend until uniform. At this point, anything that goes into the processor must be at least room temperature to keep from melting the chocolate. Add the chilies and raisins and blend some more. Then add the sauteed tomato mixture and blend until you get a nice paste. Yield is about 4 cups, but you’ll only need 2 now. Freeze the remainder for later use. Season the chicken with the lemon juice and salt. In a large Dutch oven over medium-high heat, add about 1-2 tbs oil and brown the chicken (in batches if necessary). Remove and set aside. In the same Dutch oven used to brown the chicken, add 2 cups of the mole sauce and allow to simmer for about 5 minutes. Scrape up the bits at the bottom of the pot and stir as needed to keep the paste from sticking/burning. Return the chicken and add 2 cups of chicken stock and sugar. Bring to a boil, cover, reduce the heat and simmer until the chicken is tender. Season with salt. Serve with corn tortillas or rice and other Mexican side dishes. Alternatively, the mole can be prepared in a crock pot. I almost always do it this way. I brown the chicken and simmer the paste in a skillet the night before and stick it all in the crock pot, which goes into the fridge. I’ll start the cooking (on 8 hour setting) before I leave for work, and everything’s done by the time I come home.